It is easy to be overcome with indecision when you are trying to be prepared for disasters. There are some easier ways to take some of the difficulty out of it. I like to use Maslow's hierarchy of needs chart. Psychologists and social workers and other people professionals used Maslow's hierarchy of needs chart for a long time. Some of them still use it. There is disagreement about how correct it is. I don't care about whether they agree about it or not. It works for lots of things, so I use it. The bottom is the most basic or essential needs and it goes up to things that are not as required for survival, at the top. 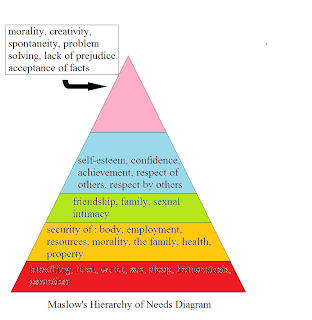 You can disagree with Maslow's ranking and change it around to suit yourself. It is handy anyway to have an easy to take in diagram to make decisions on what to get first. It also helps to decide where to put your resources. An example of this is that food might make a better investment than creativity and problem solving for your go bag. If you can't live without creativity, then a rearrangement in the hierarchy might put creativity as the first need you meet in your go bag. I like to use the two columns on a piece of paper approach. In one column I write the reasons in favor of the decision I am trying to make. In the other column I write the reasons against the decision I am trying to make. After I think that I am through coming up with reasons for and against, I cross out the ones that cancel each other out. After that I look at the reasons that are left and see what is most important to me. It sounds simplistic and stupid, but simple, stupid looking things can surprise you by working. There is a saying that I like: "Keep It Simple Stupid". The acronym for it is: K.I.S.S. That makes it easy to remember. Another decision making tool that I like to use is sayings. I sort of collect them. The right one seems to pop into my head at the right moment a lot of times. "A stitch in time saves nine," is a good one for preparedness. I am also fond of, "Don't shoot until you see the whites of their eyes." I use the last one in ways probably not intended by Colonel Putnam in the US Revolutionary War. Putnam was trying to get his soldiers to make sure they got a kill with scarce ammunition. I like to use the saying to remind myself not to be hasty, usually with a decision. I also use it when I am a little skeptical about somebody else doing something. Both of these can certainly apply to preparedness. A way to use this in the last sentence is, if you want your family to have go bags, go get the go bags. Hand the go bags to your family members and help them decide what to pack and pack it while you watch. I have found extreme sarcasm can get pretty good results. It also might get you killed by a family member. Remember to duck or get a running start before you use this method.